Whether you are out on an overnight hunting trip, or just a short travel into the woods for rifle practice, carrying the best hunting rifle sling to support your rifle is important. The sling should be of a good enough quality that it doesn’t slip off your shoulders easily. It should also fit your rifle and your body type effectively so it is not awkward to use or carry. I would suggest trying a couple of different slings at a local retailer or gun shop to see which one suits you best. Practice crouching and standing up to aim as well, so you know if the sling will be helpful for balancing your rifle. Once you figure out what you want in a rifle sling, you are now ready to take a look at the specific ones on the market. This rifle sling is great for the budget-conscious consumer. There are several good reasons why the Zengi would suit your needs for a rifle sling. The Zengi comes with wide webbing along the sling that is a great feature because it provides a comfortable point of contact with your shoulder, especially if your rifle is heavy. This is especially handy if you need to carry around a heavier gun for long distances because your shoulder won’t feel as much strain. This sling comes with wide clips so they won’t break or bend if under a little more stress. You will appreciate this feature because it means that the clips won’t need to replaced as often if you use it in rugged conditions often. It is made with flexible elastic material so it won’t be stiff when using your rifle in different positions, especially if you find you need to adjust your position quickly. This is especially handy when you need to aim quickly if you get a sudden shot. The Zengi is one of the most reasonably priced 2-point slings on the market. This is a nice feature if you want a reliable sling at an affordable price. The plastic in the construction is not very high quality and feels cheap. The Leather Cobra is one of the nicest looking and comfortable rifle slings on the market. There are several good reasons why this sling is a good fit for you. This rifle sling is made with high-quality leather and attractive in-laid stitching. The quality of the construction exceeds the reasonable price you pay for it. This is a great feature for those who want to look great when they are out hunting but don’t want to break the bank to do it. Even though the Cobra is more expensive than other slings with similar features, you may find that the high-quality material and comfort outweigh the extra expense. If you are using this sling in moderate conditions, then the nice look of the leather will last a long time. The Cobra comes with an attractive and comfortable green suede backing. This not only enhances the already beautiful look of this sling but makes it extra comfortable to carry around for hours at a time. The Paracord features several features to make your hunting experience more enjoyable and worry-free. The following are some reasons why the Paracord may be your ideal rifle sling. The Paracord is easily adjustable from 33″ to 44″ which is a great benefit to you if you choose to use it for different equipment of varying bulks and shapes or even other types of survival gear. The adjustable straps on this sling mean that you can use it for shotguns, rifles, and crossbows. The rolled nylon mesh along the strap means it can expand and contract easily so it doesn’t lose its shape. You will really enjoy this feature if you need to switch up your hunting equipment in the middle of a trip. There are 8 color options for this unit including Black & Tan, Black & Olive and Black & Coyote. You can choose the color that blends in with the rest of your equipment so your strap won’t stick out like a sore thumb. This helps keep you hidden while aiming and adjusting your position. The Ultimate Rifle Sling comes with a strong double strap made of a durable and comfortable rubber. This sling really is the ‘ultimate’ in comfort and flexibility. The following are some reasons why this sling might be the best choice for your needs. 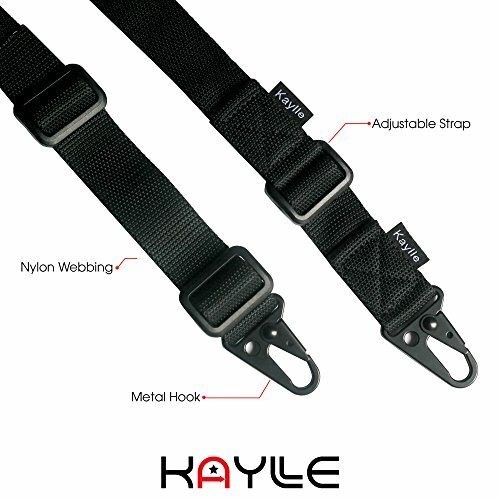 The Ultimate Rifle Sling has a dual strap system made of non-slip rubber that eliminates any worry of having your rifle slip off of your shoulder while you are walking or climbing. You will really enjoy this feature if the terrain you are on is a bit rough and you don’t want to have to keep pushing your rifle onto your shoulders. This sling can be used with any firearm and even a crossbow or muzzleloader. The design lets you carry your weapon of choice comfortably and securely. This is a great feature for those hunters who want to switch up their equipment without having to get different slings for all of them. This can also be turned into a ¾ backpack when you split the strap. This sling comes with swivels made of durable nylon that will hold up with any type of impact or variable conditions. This is especially useful if you are in an area where weather and terrain are unpredictable and extreme at times. The Blackpowder Claw uses a unique “soft touch” material that makes this sling very comfortable to use. There are several reasons why this sling may be the right one for you. The Claw Rifle Sling uses revolutionary new “soft touch” materials that make even the heaviest equipment comfortable to carry. The padding is made of a durable polymer that is molded directly onto the sling. You will appreciate this feature because it gives the extra stretch you will need for sudden movements and shifts in position. It also adds to the overall comfort of the sling if you need to carry it for long periods of time. The Blackpowder sling also comes with the patented “Hush Stalker II Sling Swivels” which are rustproof and very quiet to use, unlike some metal swivels that squeak and rattle. The strength of these swivel means that they will carry twice the weight of conventional swivels. You will appreciate these swivels because they fit most types of guns and won’t dent or scratch your equipment. This sling comes in 5 different colors that you will be able to match up with the rest of your equipment and camouflage. This is a great feature because it means that you will blend in that much more with the rest of your surrounding. This is good for game hunting where you are not that far away from your target. Comes with extra strong hooks for a long lasting usage. The distance you are traveling carrying your weapon is an important consideration when purchasing a rifle sling. The best hunting rifle sling will be as comfortable and lightweight as possible. This is especially important if you plan on carrying your hunting equipment for hours at a time. There are three different points of attachment on a rifle sling, one-point, two-point, and three-point. Some manufacturers also offer a convertible sling that can be adjusted to any of these three. A survey of the top 50 shooters in the 2014 Precision Rifle Series (PRS) showed that the 3-point attachment was widely recommended as the best option. If you use your sling to balance your rifle as well as carry it, the flexibility will be very important to you. If the sling is too stiff or doesn’t bend in just the right way it can really throw your aim off. You want the flexibility to carry it in different ways as well if it starts to get uncomfortable. Some of the best tactical rifle slings are made with inexpensive materials that still provide support and comfort. You can also choose a more expensive but much more attractive material like leather to make a statement. Some slings will come in a rubber material that hugs the shoulder and is guaranteed not to fall off under any circumstances. Swivel Type – The type of swivel on the sling is important depending on how wide your strap is and how heavy your gun is. The best rifle sling for hunting is by far the Ultimate Rifle Sling for durability, comfort, and versatility of design. While it might not be the best looking out of all the straps reviewed, it more than makes up for that in all of the features you will enjoy. The double strap makes carrying around heavier equipment easy and comfortable. If your shoulder does end up getting fatigued, then you can adjust the sling to be used as a backpack to reduce strain. You will always feel secure with the rubber grip of this sling because it completely eliminates any slippage that you might experience with other materials. I would highly recommend this sling to anyone who wants the comfort and security of a well-made and non-slip rifle sling.